So, this past week has been fairly difficult to say the least, hence why there was no Sunday Spotlight last Sunday. Basically I was taken to A&E on the Wednesday with awful stomach pains, which had been getting worse since Tuesday night. After waiting for 3 and a half hours, I was ushered through to Majors, where they wasted no time in sticking canulas and drips in me and taking blood. I was then wheeled through to the Surgical Assessment Unit (this is when I started to panic – the word surgery isn’t very appealing!) I was seen by two surgeons who decided I needed a CT scan, so at about 2.30am I went to have that. I just thought I’d be given some painkillers and packed off home, but at 3am a doctor came to tell me that they’d seen what they thought was a 4cm mass on my right ovary and fallopian tube, and that a surgeon would come and see me first thing. The surgeon was lovely, but told me there was a likelihood that they would need to remove the ovary/fallopian tube, which was a bit of a shock. So, I waited all day to go to theatre, but nothing happened. Then another consultant came to see me to say they’d like to do an ultrasound before doing any surgery, so off I went to Radiology. The scan was inconclusive, so they then wanted to give me a few days to see if my symptoms improved. They didn’t – they got worse and I was now not able to keep any food or water down. So, on Sunday evening I was taken down for emergency surgery, spending 6 hours in recovery because I was so unwell after the procedure. I found out the next morning that they hadn’t been able to find the mass, but that my appendix had been removed. It seemed to help, as I was then able to keep a hot chocolate down and the pain had improved. They let me go home on Monday evening, and although I’m rather sore and very tired, it’s so good to be out of hospital! 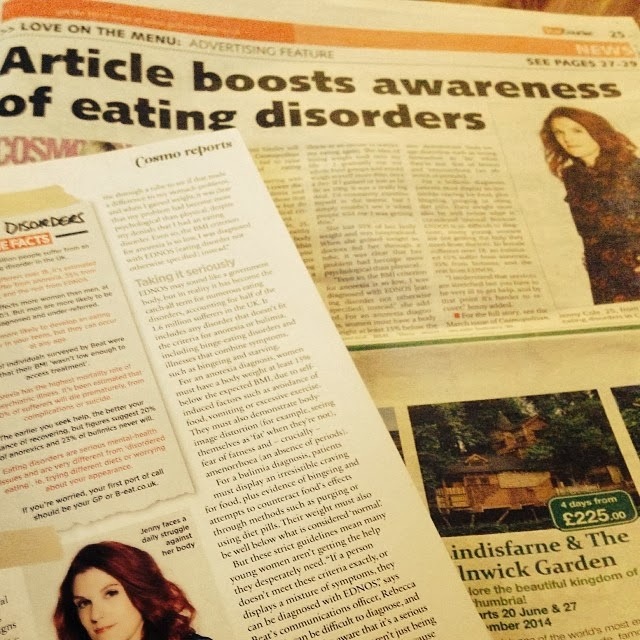 My article about Eating Disorders finally came out while I was in hospital, but I wasn’t well enough to look at it until this week. It was originally published in Cosmopolitan, with a piece on their website, and was then in my local newspaper a few days later. I’ve had so many amazing comments from friends and family about it, and I just hope that it will help raise more awareness of what eating disorders are really like. I also had an e-mail this week to ask if the US Cosmopolitan can publish the online article on their website, which is pretty exciting! Something that has really cheered me up this week was receiving some beautiful fresh flowers in the post from my Aunt and Uncle. 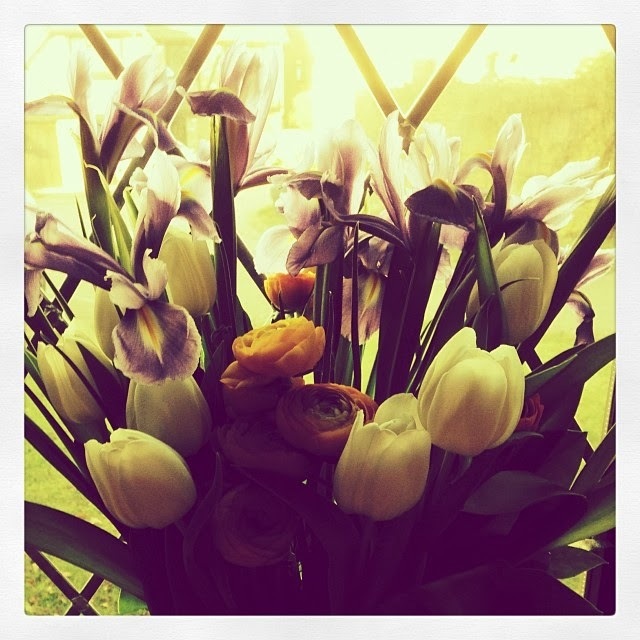 I think it’s always lovely to receive flowers, and no matter how ill you’re feeling they can really brighten up your day. They are currently sitting on the lounge windowsill, where I can see them as I rest, and they look even more gorgeous now that they’ve opened up.